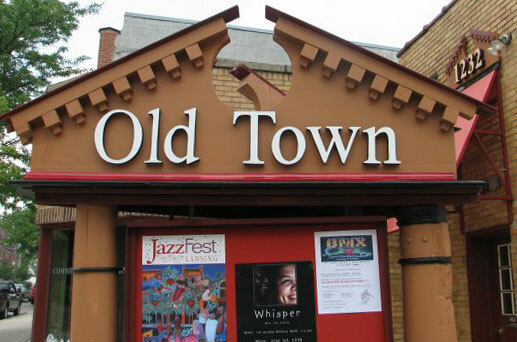 You may feel like Old Town is a hidden treasure, but once you are familiar with Lansing’s historic downtown, you quickly realize all roads lead to Old Town, with plenty of transportation and parking options to choose from. Travel on 127 North to I-496. Head West on I-496 for one mile. Take the Pennsylvania Ave. exit #7 toward Larch St./Cedar St. Take the Larch St. ramp toward Cedar St. and turn right onto S. Larch St. or I-96 Business Loop. You will now be heading North for a mile and a half, past the Cooley Law School Stadium. Turn left onto E. Cesar E. Chavez Ave. (formerly East Grand River Ave.) You have now found yourself in the heart of Old Town Lansing. Travel on 127 South to the Lake Lansing Rd. exit #79. Turn right onto Lake Lansing Rd. and pass through one roundabout, just short of two miles. Take the first left onto N. Larch St. Stay straight to go onto N. Cedar St. Take the second right onto E. Cesar E. Chavez Ave. (formerly East Grand River Ave.) You have now found yourself smack dab in the middle of Lansing’s arts and entertainment district. Travel on I-96 East toward Lansing. Take the I-96 Business Loop/Grand River Ave. exit #90. Turn left onto West Grand River Ave. and continue to follow I-96 Business Loop seven miles. Turn right on Turner St. and voilà—you’ve made it to the neighborhood with time to spare. Travel on I-96 West toward Lansing and merge onto I-496 West via exit #106B toward Downtown Lansing. Travel on I-496 for five miles. Take the Pennsylvania Ave. exit #7 toward Larch St./Cedar St. Take the Larch St. ramp toward Cedar St. Turn right onto S. Larch St. or I-96 Business Loop. Travel a mile and a half, past the Cooley Law School Stadium. Turn left onto E. Cesar E. Chavez Ave. (formerly East Grand River Ave.) and presto—you are ready for a cocktail and a keen shopping trip in your favorite creative destination.